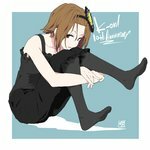 One of the main characters of K-On! Self-proclaimed president of the Light Music Club (and the driving force behind its revival) as well as its drummer, playing a Rick Marotta Signature Yamaha Hipgig drum kit. Energetic and tomboyish, but also forgetful of club activities (as expected of her station) and fond of teasing her shyful friend Akiyama Mio.